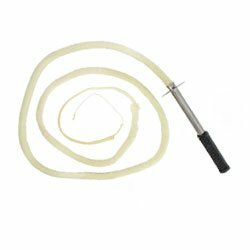 Buy Leather Stock Whip | Nylon Bull Whips and Fire Whips for Sale. WHIPS ARE NOT TOYS. FOR SALE TO OVER 18s ONLY. 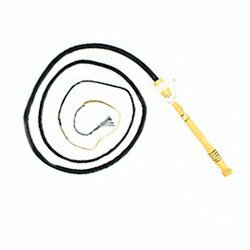 We stock are range of whips for beginners and experts and to suit all budgets including cheap leather whips; wooden handles whips; durable, all weather nylon whips; stock whips; high quality, US made cowhide whips and our very own fire whip. 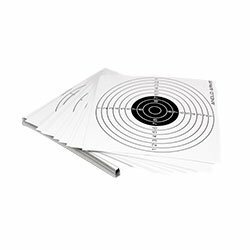 We also stock these in a variety of lengths from 4 foot to 10 foot. There is also a range of books and DVDs to teach you how to crack a whip in many different ways. We sell whips purely for performance and leisure purposes; you should never use a whip on a living creature and you should always crack a whip away from other people. Relevant safety precautions like goggles and ear defenders should be worn. If done safely, whips can be a lot of fun – it’s very satisfying to know you’re breaking the sound barrier! There are lots of different cracking techniques to learn and advanced whip crackers can use a whip in each hand. Whips make for great performance props with the loud crack exciting your audience. 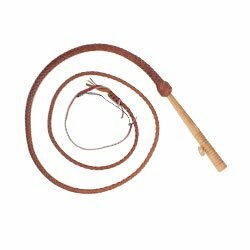 For the ultimate whip performance though, look no further than our 6’ fire whip. “It makes people scream [with excitement]”, to quote one satisfied performer! As the fire whip cracks it releases a large ball of flame as the excess fuel is ejected from the whip. Safety information is provided. We also have spare falls and crackers as these wear out with use.